“Summertime and the livin’ is easy” is always on our minds come June, July, and August—along with a desire for refreshing lakes, ponds, and pools. For those of us living in the mountains, homes on the water can be few and far between. Our May/June 2016 indulged this craving with our “Escape to the Lake!” theme, where we featured a graceful Montana lake cottage, an idyllic home on Idaho’s Lake Pend Oreille, an unexpected home makeover on Montana’s Lake Blaine, and an architect’s personal lake hideaway. We recently spoke with Jeff Dungan—an award-winning Alabama-based architect who has created numerous homes near the water in the American south… and all over the world. 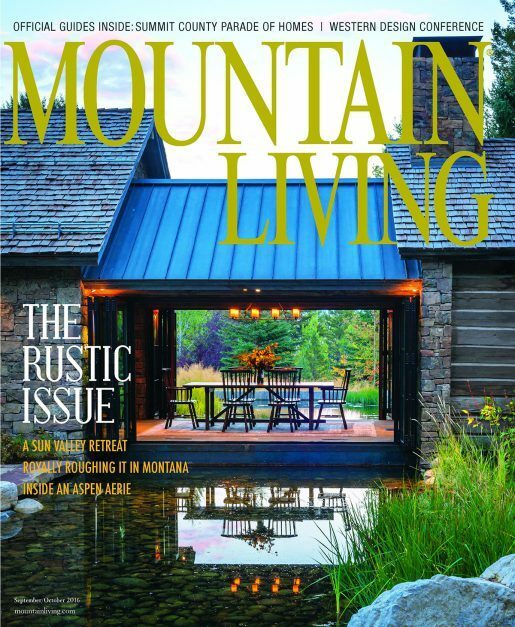 As Dungan expands more of his work to the American west and its mountainous landscape, his excitement for marrying lakehouse design with mountain living is rooted in his passion for each individual home’s site and the unique vistas that accompany it. Here, his thoughts on lake living. What does the “lake life” mean to you? I have come to enjoy the “easy living” of lake life. I grew up on a rural Alabama farm and loved grabbing my handy fishing pole and heading out on an adventure to nearby lakes and ponds. Out on a little john boat or a skiff floating fairly aimless, the houses would quietly melt away, punctuated by the occasional splashes of bass or bream dancing on the end of the line. When it gets too hot, hopping into the water off the dock or from the rope swing provides relief from the wrath of the summer sun. What do you keep in mind when designing a home on the water? When we design homes at the lake, we always take into account that unalterable solar force which gives us light and warmth, but can be a little “too much sugar for the dime.” I like to think we design more like people did 100 years ago, when they could not walk over to the wall and merely push a button to make the temperature more comfortable. It’s important to incorporate porches and the longer overhanding eaves to provide smart “sunscreen” for shelter from the sun and summer storms. We study the path of the sun over the site and begin to form thoughts about how the house lays out on the site based on these factors. Along with those all-important views of the lake and the undulating contours of that particular pieces of the earth, the design starts to emerge. I have long held that if you listen to the site, the house will design itself… well, almost. If only the thoughtful design of a home was as easy as the summertime living we hope to do there! Wherever you find yourself this summer, I hope it’s a fun and enjoyable place. What are you most excited about when it comes to working out west? The raw fuel of creativity is inspiration. People inspire me, words inspire me, but I get most of my inspiration from nature. The American west is such a beautiful part of the world. Nobody would disagree that the scenery is inspiring. Dungan will be speaking at the Denver Design District Thursday, June 30, 2016.